Upstairs bathroom progress? Not so much. Well. Maybe a little. I'm thinking about maybe being almost ready to sort of consider the possibility of starting the upstairs bathroom renovation project. Since we have two full bathrooms, it's been easy to put off renovating one. Let's recap the Holyoke Home upstairs bathroom, shall we dear reader? Ok. When we moved in, the upstairs bathroom had vinyl floor glued to plywood nailed to original fir floor. The walls were covered in hideous wall paper from the waist up and hideous HUGE vinyl panels from the waist down. BUT ONLY ON ONE SIDE. The other side had the same original wide bead board we found during our kitchen demo and renovation. Our budget for this renovation is SMALL. Super small. Super duper small. Like maybe $100 plus the cost of electrical. My first project will be refnishing the floors. 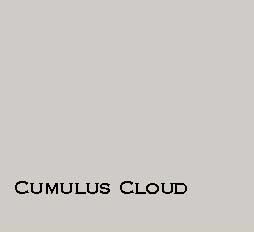 I've chosen Cumulus Cloud by Benjamin Moore. 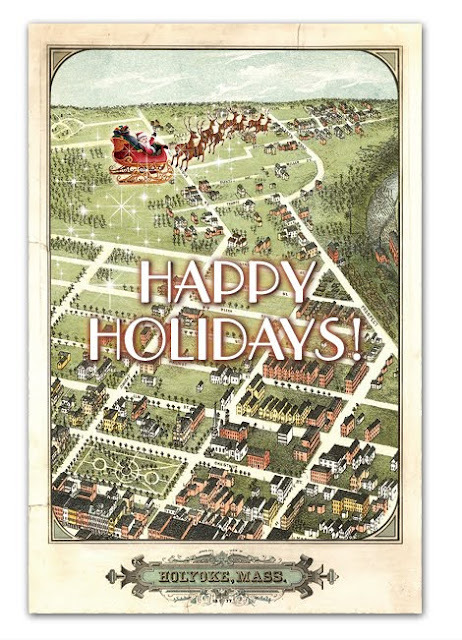 Huge thanks and hugs to Susie Roselle from Dottie and Belle, for making Holyoke Home's holiday card! As in our 'We've Moved' card, we used a section of the 1877 map of Holyoke, downloaded from the Library of Congress' website, roughly showing the part of Holyoke in which we live. Looks like Santa's on his way to Northampton! Someone stop me before I start sticking 'winter berry' fronds into random flower boxes/front yards/ears. Those shiny red globes provide the nicest little visual break from the cold and brown of winter in western New England. Those are boxwood branches in the back, and some ivy that turned red all on its own in front. 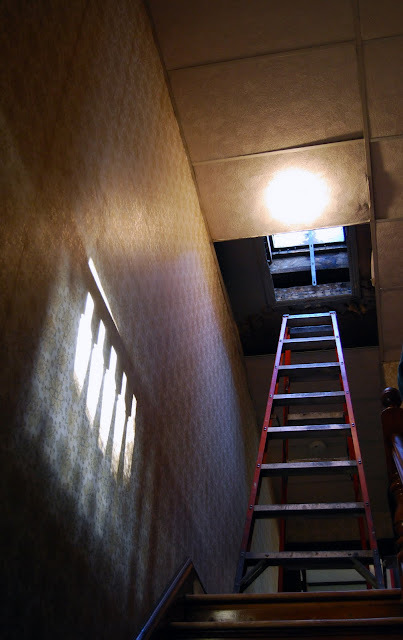 Holyoke Home Owner #1: What are you doing in the attic crawl space? 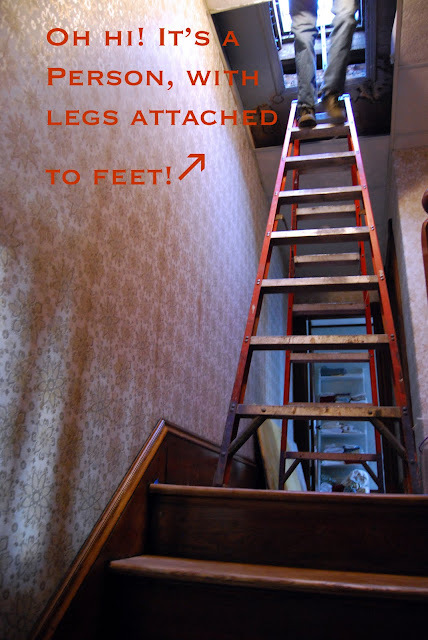 HH2: I was looking to verify the attic conditions so the contractors can match the work needed to their bids. I took lots of pictures. HH1: So what is involved in air sealing? HH2: It's basically sealing pathways of air from the conditioned air in the house into the attic, either up through hollow walls or between the exterior brick wall and the interior plaster. HH1: Do we need a lot of air sealing? HH2: No. It's actually not that bad. HH1: And then after air sealing, we'll blow in cellulose insulation, right? HH1: Did either one of the insulation contractors call you back? 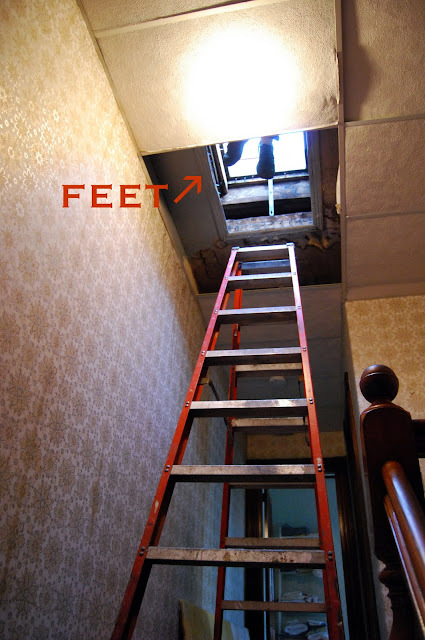 My mother spent last December on her hands and knees in a crawl space. Year after year, she carefully balanced mountains of holiday CRAP in the pine scented closet under her basement stairs. You want to see what forty years of Christmas YA-HA looks like? Okay. All we ask is that you open the door CAREFULLY: A collection of green Santas, (Seriously. If it was Santa? And he was green as opposed to red? He's probably in there), innumerable ornaments, swags a go-go, christmasy candles, giant shiny balls, at least two creches, advent calendars, wreaths, all sizes of plastic trees carefully packed up with lights and ornaments intact, holiday themed welcome mats, and a multitude of heavenly hosts singing, "Glory to God on the Highest! And Peace to his people on Earth!" She decided to "weed out her stash" and asked what my sister and I wanted. I could have had it all: A smorgasbord of green Santas. A ton of tinsel. A plenitude of painted pine cones. But the only thing I wanted? The one treasure? 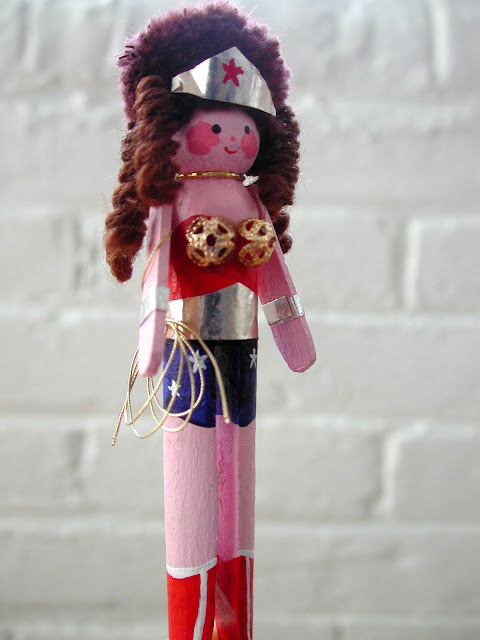 A Christmas ornament my mother bought for me years ago, when I was a little girl with dark brown hair and awkward little-girl glasses, who was crazy about Wonder Woman. Someone took a clothes pin and dressed it up to look like my hero. Right up there with turning water into wine if you ask me. Holyoke Home follows Goodwill on Twitter (Hi Goodwill!) because I love to visit our local Goodwill stores and Salvation Army stores, and other thrift stores. Maybe it comes from having parents who were antique collectors and dealers (for a little while), but I definitely am cheap, like to get my shop on without spending a lot of money, get a thrill from the hunt care about reducing, reusing and recycling. One of these days, I'm going to create a 'Holyoke Home's Guide to Local Thrift Shops' because there are truly some INCREDIBLE thrift stores (there are four Salvation Army stores within 10 miles ALONE. But only one of the four is worth visiting. Maybe I'll tell you which one some day) but for now, I want to share this find. 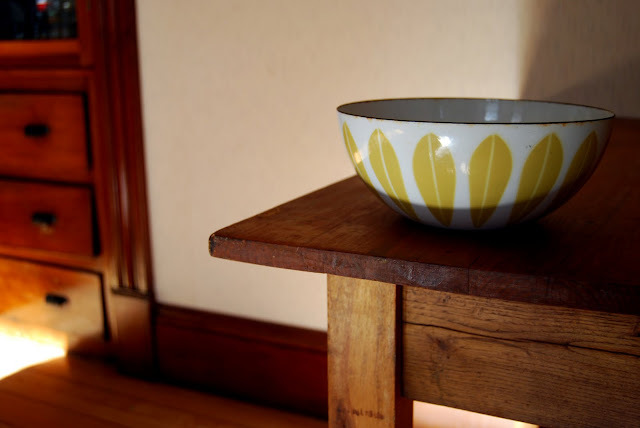 It is a white and yellow enamel bowl. I know nothing about it other than: I love it. The clean lines, the modern design, the shiny. Everything. Thanks Goodwill! It hasn't found its final place in our home. 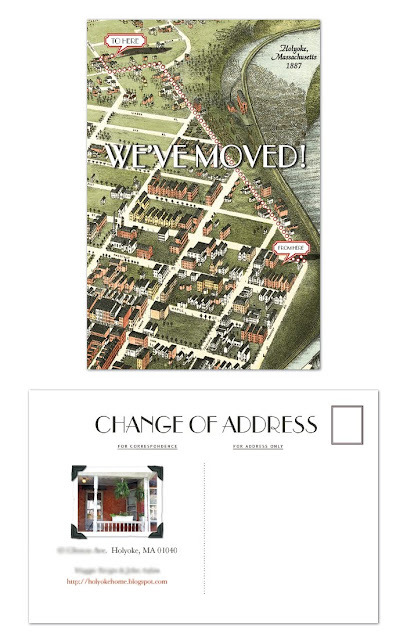 Remember our incredible 'We've Moved' card? It was designed by my incredibly talented friend and designer Susie Roselle (seriously. Check that link. Her work is AMAZING.) Well, Holyoke Home and Dottie and Belle (Susie's company) have teamed up once again to create a Holyoke Home holiday card. Susie sent me the proof yesterday and can I just say: Oh. Yeah. You're probably already on my list, but if you leave an address in the comments, I'll be sure you get one. Okay! Okay! I'm Reconsidering the Lights! Boy. Y'all really liked my five-drop pan lights. Holyoke Home hasn't had 17 comments since I posted a blog entry about skimcoating over wallpaper. I've learned a lot from your comments and done some research of my own. 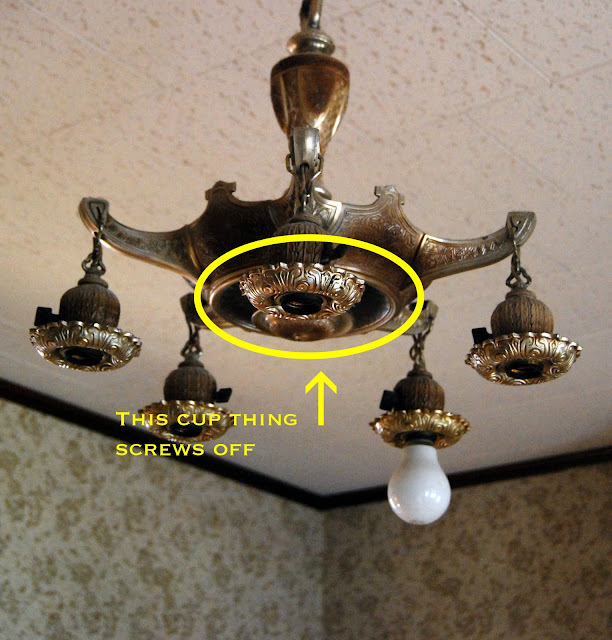 The lights (two out of three) may possibly be original to our old brick row house, but they are definitely of the era. Upon closer examination, two of the three lights are IDENTICAL. How did we not notice before?! And also? Holy cow They might be valuable. A similar light sold online recently for $600. That could buy a lot of mulch and flowers for the backyard things we really need. I'm still not sure what we'll do with our pan lights, but I promise to keep you updated.